Michael Dunnagan was never supposed to sail on the Titanic, nor would he have survived if not for the courage of Owen Allen. Determined to carry out his promise to care for Owen’s relatives in America and his younger sister, Annie, in England, Michael works hard to strengthen the family’s New Jersey garden and landscaping business. Annie Allen doesn’t care what Michael promised Owen. She only knows that her brother is gone—like their mother and father—and the grief is enough to swallow her whole. As Annie struggles to navigate life without Owen, Michael reaches out to her through letters. In time, as Annie begins to lay aside her anger that Michael lived when Owen did not, a tentative friendship takes root and blossoms into something neither expected. Just as Michael saves enough money to bring Annie to America, WWI erupts in Europe. When Annie’s letters mysteriously stop, Michael risks everything to fulfill his promise—and find the woman he’s grown to love—before she’s lost forever. Cathy packed so much into this book! From the Titanic to zeppelin raids, she kept me surprised with every turn of the page. Near the end of the book, just when I thought everything was going to turn out ok, she threw in another twist. Then another. I really had no idea if the final outcome would end to my satisfaction! Love, hate, bitterness, guilt, fear, grace, and forgiveness – it’s all in there! Promise Me This put me into past-midnight-reading-mode for two nights straight. Thank you to Cathy and Tyndale House for sending me a copy to read and review! 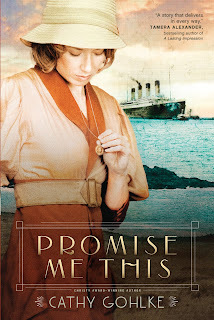 Thank you, Stephanie, for your excellent review of "Promise Me This!" So sorry to have kept you up at night, but I'm delighted you persevered through all the twists and turns! Many thanks, and God's blessings to you! Looking forward to your next book! You have one in the works, don't you?! I thought that this was going to be a Titanic story but it turned out to be more of a WW1 story. Either way, it was fantastic! I really enjoyed this book. The characters were realistic and engaging. Yes, Canada, it was a very unique story! Had a little bit of EVERYthing in it! I'm looking forward to her next book, Band of Sisters, which is set to be published in September! Pinterest made me! Kiss Pies!